Trang and Ryan Hammond vacation in Kauai regularly; it's like a second home to them. Years ago they returned to Cali from vacay and started to miss "Hawaii" things. They missed the perfect tank top/board short weather, the warmer/clearer water, Trang missed easy access to Ahi Burgers, and Ryan really missed the Chocolate Peanut Butter Oreo ice cream from Tropical Dreams. Knowing that they couldn't do anything about the weather or water, they were driven to find a way for Ryan to fulfill his "tropical ice cream dream". After all, opening up their own small business would allow them flexibility to raise a family while making sure the bills were being paid (aka Milk Money, aka C.R.E.A.M. get da money, dolla dolla bills y'all). A few years later, their vision has not only come to life, but they now have 3 shops (in the San Diego area) and 2 kids! Hammond's ice cream has also become a popular fixture at our I Love Poke San Diego event (Get tickets now! Tuesday May 23rd!). 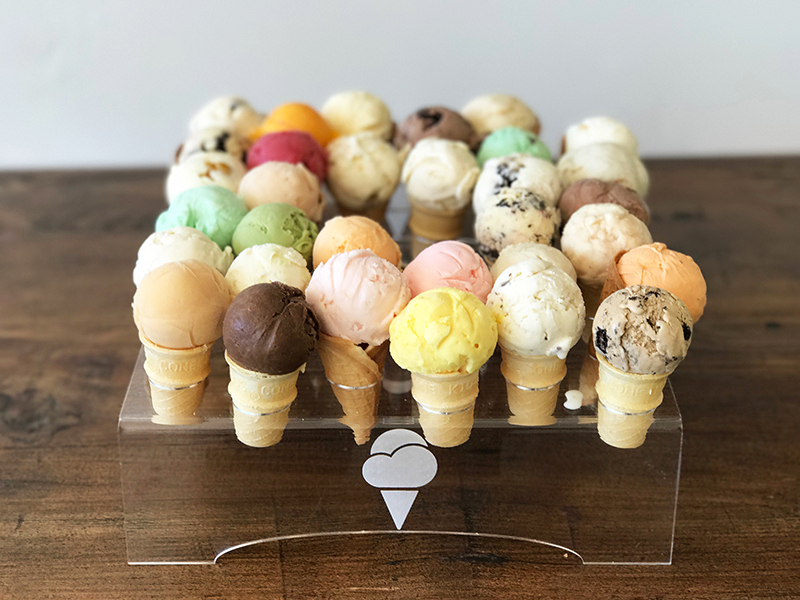 We sat down with Trang over a 32 flavor flight of ice cream (yes THIRTY TWO) and gathered some quick facts to share with you while trying to taste all flavors (between two people) before it all melted away. 2. 32 flavors are always on scoop at the shop (They one-upped ya Baskin Robbins!). Over 300 flavors are on rotation throughout the year. 20 staple flavors have a home there 365 days a year and 12 others are integrated in as seasonal or special options. 3. Chocolate Peanut Butter Oreo is what started this whole thing. It was so good, Ryan Hammond wanted to share it with all of San Diego. Be sure to try the flavor that started it all! 4. Lychee Cream (an Ono Yum FAVE), Thai Tea, POG Sorbet, Poha Berry, Ube, Pineapple Coconut, and Ginger Cream are options that are unusual to the mainland palate but a must try for anyone who loves Asian/Island flavors. 5. Hammond's is the only ice cream with the Hawaiian Seal of Agriculture which means 50% of their ingredients come from Hawaii. 6. Upcoming summer flavors making an appearance to the 300 flavor rotation are cotton candy & strawberry margarita sorbet. 7. For all you vegan-tarian or intolerant peeps out there, Hammond's has at least 4 sorbets and 1 vegan flavor available. 8. Their logo looks like a scoop of ice cream but the graphic reflects the sun coming up out of the clouds. It is reminder of how the Hammond's once dreamt of having their own business and made it out up over the clouds to bring some Hawaii sunshine to San Diego.